Even though the elk hunting was pretty tough this weekend we still managed to be in the right place at the right time at least once. The elk haven't got fired up yet, but I think they will be very soon. This whole weekend I only heard 4-6 bugles. Danny got in to one bugling bull, a real dandy, and came to full draw three times but the shot was just never there. He also had some very close encounters with two other big bulls but luck has not been on his side yet this season...yet. I hunted this unit a long time ago, but not very much of it. The vast majority of the hunting I've done this year is in places where I have never been, or have not been for many, many years. It is kind of a fluke that we ended up hunting in the drainage that has produced the most action this year. My Mom spotted a lone bull above timberline at around 9am on opening day, quite late in the morning to be out in the sun feeding. That was enough to make her and my Dad to go check it out. They should have shot a bull in that drainage opening day, at 2pm my Dad called him to 20 yards but just couldn't get a shot. Saturday I hunted with my parents back in that same drainage. We saw probably 30 elk above timberline, including a few real nice bulls. I'm sure there were many more that we did not see. Not bad for this small area! They were feeding above timberline and going either to the left, right, or straight over the top of the hill, none came down. We slipped in on several elk that morning and did a little bit of calling. A gangly spike came running full tilt down the hill towards us. If he was a person he would be a perfect Napoleon Dynamite - all clumsy and goofy looking when he ran. At about 30 yards he threw on the brakes, looked around, and then cut in to the trees. There was something he did not like, ah well. Since all the elk were in huntable locations we slipped out knowing that they would be back the following morning. We would have done some more calling but the wind started swirling. That evening I went out by myself and made a five mile hike in a different place, but it was all for naught. So I ran over to a spot where I could glass our drainage the last 20 minutes before dark. I only saw a few cows but I knew the elk were still all there. I ran in to another elk hunter who was camped back there with his wife and son. He was camped on one side of the drainage so we never went near him and hunted the very far side. We left the majority of the elk we saw for him to hunt. 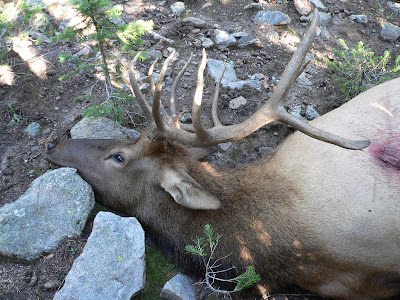 We made some common sense observations about the drainage before we had ever seen what the elk do up there. There is a big saddle that runs right over to a very steep and nasty north facing ridge. We figured that they probably crossed through that saddle and bedded on that nasty hill. When we finally observed elk we saw them doing exactly what we had suspected. The following morning, since we had seen a good number of elk moving towards that saddle, we planned on still hunting our way there, and then doing some blind calling once we got there. My brother-in-law Kelly was with us, so there were four total hunters. We usually split up when there is that many of us but we wanted to cover as much of that saddle as possible, so we all went in together. We still hunted for the first hour or so of the morning until we reached our saddle. Once we got there we hung out for 30 minutes or so hoping to catch something coming through. We split up, about 40 yards apart, in line with the wind which was coming down the hill (that was fine because we did not expect elk to come from below us). I was the furthest up the hill, my Dad was the furthest down the hill. The two of us did the most calling with Kelly and my Mom chirping in as well. We started soft. About five minutes after we started calling I noticed an elk coming down fast. He was still 100 yds out so I made a few more very soft calls and waited. I knew my Dad would keep calling 100 or so yards down the hill. Everything worked out just perfectly. The elk kept coming fast, looking downhill for the "elk" that he was hearing. His approach kept me concealed the entire time. There were shooting openings in all directions, but I was hidden enough so that he would never see me until he was in a shootable position. I kept looking ahead of his path, picking out places where I could shoot if he held course. When he got to 25 yards he went behind some thick trees, I drew. He stepped out in to my opening, moving, but not fast. As soon as his front leg appeared I let go of the string. My arrow flew perfect, hitting him about an inch higher than my aim. He crashed out of there, he was mortally hit. I called to try and stop him, more out of habit than necessity, but he never stopped. I knew it would be a short track. This is a screen shot of Google Earth so you can kind of see the terrain. I marked on my GPS where I was when I shot, and where we found him. I enjoy seeing exactly where I was and, sometimes, where I SHOULD have been. A view from my shooting location. I knew that everybody should have heard him crashing off. About five mintues later I heard my Dad whistling to locate me. We speak our own whistle language in the woods. We have a few distinct whistles, "where are you", "don't move a muscle", and "come here" are our most commonly used whistle communications. I have tried them with elk at 50 yards just to see if it alarms them and I have never seen an elk so much as turn an ear when I whistle. We all got together and talked about the shot placement, the elk's reaction, how much arrow penetrated him, etc. We were all very confident that we would find the elk in a short amount of time. About 30 yards from where the elk was standing at the shot we started seeing trees and stumps like this. Looking good! To all of our surprise the heavy blood trail did not last very long. After 75 yards or so we were tracking his hoof prints and finding very little blood. It did not have me worried, but it was not what I expected. About 100 yards or so down the trail my Mom said, "holy cow I sure can smell elk". I knew we were close. I took my eyes off of the ground and started scanning the woods ahead of us. There he is! In all the years of elk hunting with my Dad this was the first time we were actually together when either of us killed an elk. Hugs went around. I used my 56" Hawk recurve, 59@28, and a VPA Terminator broadhead. It was the first time I carried three blades hunting elk. Penetration was okay, there was a hole on the far side in the ribs but the broadhead did not poke through the skin. It went through the whole body cavity but I sure like to see an exit hole. The blood trail was less than average even though it started strong. I think the hit was a little higher than a good blood trail producing hit would be, but obviously still low enough to produce a very quick kill. I will be adding this broadhead to my arsenal, for sure. The first human hand to touch this magnificent creature. My mom had a knee replacement last year and this is the first time she has been able to walk the elk woods in quite a few years. Having her there made this hunt all the better! I shot the elk at 7:35am. We had all day to take care of him, and with four of us doing the work we got the cleanest elk meat we've ever done. There was hardly a hair or speck of dust on any of it. Gonna eat good! Three seasons ago I got a new day pack even though I was not in the market for one. We started selling Horn Hunter packs in our store back then, and I was really impressed with the idea of being able to strap meat to my day pack. That way I wouldn't have to walk all the way out for my frame pack, and then walk all the way back in to start carrying meat. It was the best decision I ever made. I have carried four animals out with it now and there is no other way to do it. I have not even touched my frame pack since buying this day pack. It is by far and away the best way I have ever packed meat. I am using the Horn Hunter Mainbeam pack. I wish the hip belts were adjustable because I am a small guy and it rides a little low, but otherwise it took this load without problem. I guessed the weight of my pack afterwards at 70lbs +. Not an overly heavy pack, but it was still easy. Kelly is a freak of a human being. He is carrying a front and a hind quarter, and he never even commented on the pack being heavy, light, uncomfortable, anything. Just smiles the whole way out, though I pretty much only saw his back the whole time. Kelly used the Horn Hunter Full Curl pack. His pack was much heavier than mine and he was totally comfortable the whole time. I am totally sold on these packs. We stopped about every tenth of a mile at first! Had to get our legs and mind geared up for the walk out. In all actuality it was all down hill, and pretty flat at that. It was not the easiest pack out I've been on but it was up there. The season is not even half way done. Looks like I am covering the archery store for my Dad and brother the next few weeks and calling for them on the weekends. I still have a mule deer tag but they are not plentiful in this area and I do not expect to see one, much less shoot one. At least I still get to carry my bow. Check back because I will be sure to have more pictures, and hopefully another successful hunting story or two!